How can design help everyday customers manage and secure the extensive amount of IoT devices in their homes? The Internet of Things is rapidly growing as a market for consumer electronics and the IoT-ecosystem is becoming increasingly complex. However, there are a large host of challenges for making IoT work reliably in the home. With continuous news on IoT cybercrime and the ever widening IoT eco-system, Intel and CMU CHIMPS Lab initiated this project to explore and design ways to enhance user control on IoT privacy and increase data security and transparency. How can we make it easy for everyday users to manage dozens or hundreds of smart devices with different user interface (possibly no interface at all)? How can we help people with little expertise manage the privacy and security of their devices, especially in the case of multiple users? We propose to design, build and evaluate an IoT Hub that offers services and functionality to help managing and securing IoT devices. The IoT Hub will make it easy to add, manage, connect, and secure Internet of Things devices in the context of homes, especially low-end devices that have minimal computational and networking capabilities. To tackle the privacy issues with existing IoT eco-system and to discover design opportunities in frictionless interactions, I did background research and interviewed engineers regarding the intended back-end implementation of the IoT Hub to understand the technical limitations, specifically about the ways in which smart devices communicate with the network. Utilizes Manufacturer Usage Description (MUD) as a whitelist with restricted websites an IoT device can access for manufacturers (or other entities) to specify normal behaviors for devices. Proximity by Default: users have to prove proximity to before they can access the Hub and devices, as unfettered remote access is a major source of security problems for IoT. After background research and gathering information from previous designer about reasons behind key design decisions, we conducted card sorting and user interviews to examine previous insights about user behaviors. During card sorting sessions, participants were provided with 40 smart devices that exist in different physical space in the context of a home (e.g. TV, thermometer, refrigerator, game consoles, etc). How do people organize and interact with numerous devices in the the context of home? What are the different access scenarios for families and guests and how can flexibility be achieved without compromising privacy and security? More people associate the devices based on their functionality, or with a physical space that stands for a type of functionality in the house such as kitchen or bathroom. 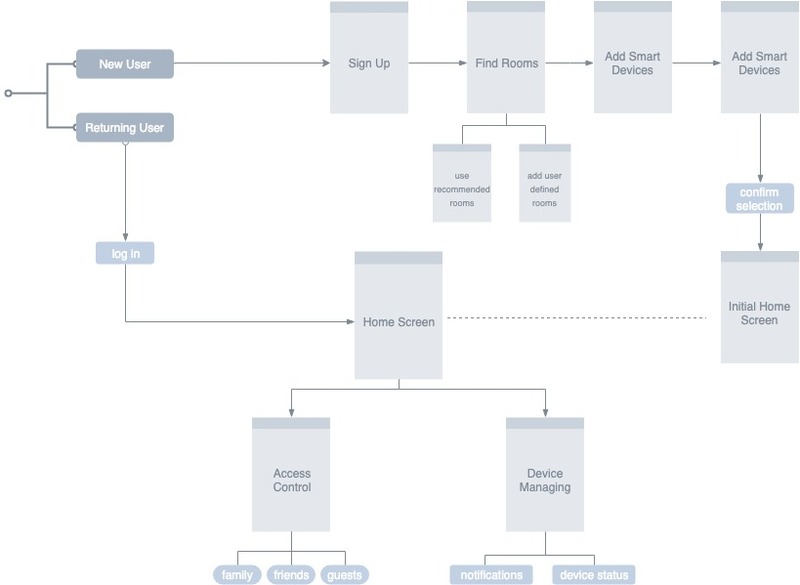 Based on the discoveries, to implement a relatively simple and effective approach that is easy to adopt and extensible, I created a flow chart that illustrates the process from on-boarding to managing devices, and to access control. We incorporated Material Design because our client is Intel, and therefore the design needs to resemble an Android application. We started out by designing the on-boarding experience to add devices and rooms to the IoT Hub, as this was not explored in the previous design. Then, we focused on improving the high fidelity UI design of the screens regarding viewing and managing the devices. The welcome screen introduces user to the IoT Hub application, and helps user set up a secure account. The user can then set up rooms that will be used to locate the smart devices via existing recommendations or adding a new room with customizable name and thumbnails. This features shows that the user can go into the specific room setup earlier and detect IoT devices in that location. Because of potential error of proximity, we build in manual editing for user to select from the detected devices about which ones to connect. A clear information hierarchy with sectional organizations for different user actions based on priority. Activity logs allow user to view the activity histories of various devices sorted by function and help identify and locate abnormal activities for security. The access page is designed to accommodate different groups with various levels of access to devices granted by the admin user. For security and privacy purpose, the default will be that new members have no access to any device. The device permission layer per guest allows admin user to grant access to each added member. The device permission page is solely for managing device access for individual member. The admin user can grant access by rooms or functions, such flexibility comes in handy particularly for managing airbnb guest.